If you’re taking photos, upload them to Flickr or Zooomr, then use at least the following tags: warpedtour, warpedtour2007, Pomona, [band name], [band member]. Should I create a Flickr group? 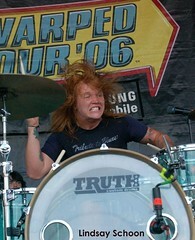 Photo of Underoath’s Aaron Gillespie taken by cmcentral. Update 6/30/2007: I uploaded all the photos I took yesterday to my Flickr account. Here’s the photoset.